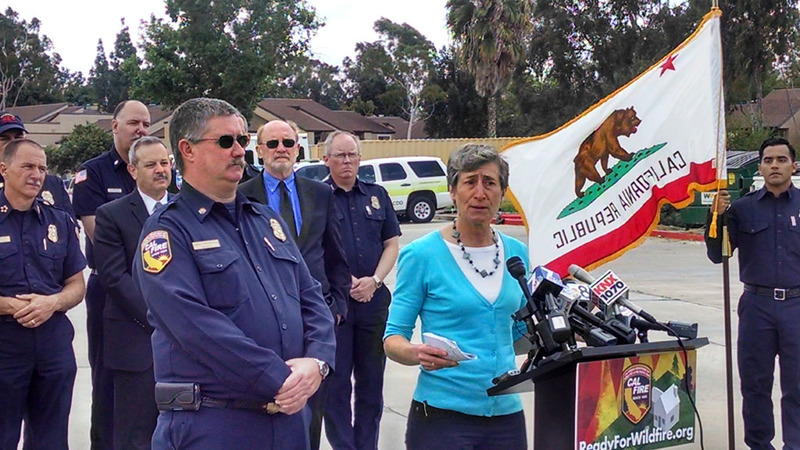 Following a weekend of wildfires that underscored the danger, Interior Secretary Sally Jewell joined local and state officials at the local Cal Fire headquarters to call on San Diegans to prepare for a potentially unprecedented wildfire season. 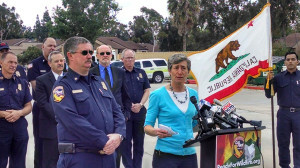 Jewell joined officials from Cal Fire, the state National Resources Agency, the California National Guard, the U.S. Forest Service and other agencies at Cal Fire’s local headquarters in Rancho San Diego to ask Californians to prepare evacuation plans and clear areas around their homes. The state has created the ReadyForWildfire.org website to help residents prepare themselves and their property. This is also “Wildfire Awareness Week” in California. John Laird, secretary of the state Natural Resources Agency, noted that 95% of all wildfires are caused by people through campfires, sparks from equipment and other causes. He warned San Diegans to “be careful, be prepared” for what could be one of the worst fire seasons in the state.